I think the animals are going wild this week at The Talbert Zoo. Nice weather and summer time just around the corner is contributing to the "wild-ness." Yesterday Monkey scared us half to death. He asked me if he could play outside but I told him that he had to wait because I was just getting out of the shower. I had all the doors locked downstairs but the Monkey escaped. When I got down there I noticed that the sliding glass door was unlocked and Monkey was nowhere to be found. He has done this before, but I still panicked. After calling Chris and circling around the house hollering Monkey's name about six times, I had to wake Bear up from his nap and jump in the van to search for our little primate. I had the whole neighborhood involved in the search which lasted about a half an hour. Chris came home and found Monkey in the house crying. While I was driving around the neighborhood he let himself back inside through the sliding glass door. I must have left it unlocked. Apparently he was at the neighbor's house just on the other side of our cul-de-sac, but for some reason I couldn't see him when I was searching in our yard. Monkey was disciplined and we are relieved that he is safe now. He'll probably do this again so next time I will make sure to search the cul-de-sac better. Chris and I have a meeting scheduled with Parrot's teacher next week. We are so proud of how far he has come socially over the past year. At the beginning of the year he had trouble looking you in the eye and replying when his name was called. He also would only converse with adults and his siblings. Today he looks at you when you clap while saying his name, is talking about two friends that he has at school and even has an imaginary friend. We never imagined in a million years that Parrot would have any sort of imagination let alone an imaginary friend. Parrot and Monkey play this game on the swing set in the back yard. 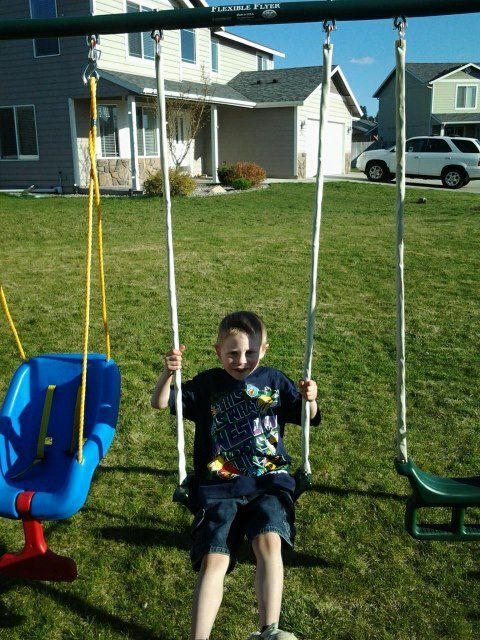 Monkey plays on the air glider and Parrot swings on the swing. They pretend that Pinky Pie from My Little Pony is on the air glider with Monkey and Parrots imaginary friend, Fishy Fish is on the swing next to Parrot. Yesterday the two boys were playing this game. As I was watching them I saw Parrot jump off of the swing. Seeing an empty swing, Kitty decided to go on it. This made Parrot extremely upset. 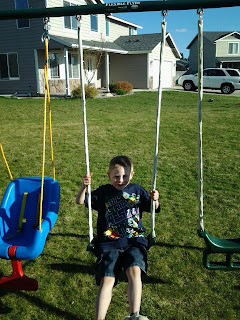 He yelled, "You can't go on that swing! I need that swing! Fishy Fish is on the other one and I don't want to squish him." I told Parrot that he needs to chose another swing or go on the air glider with Monkey. He did not think that was a logical solution so instead he punched Kitty repeatedly on the chest until she got off of the swing. I disciplined Parrot. He'll probably still do that again. After an ice pack Kitty felt much better. Jew Water - most frequently spoken by Bear, definition ice water. We've decided that beer is German Water and wine is Italian Water. If it is a hot day make sure you drink plenty of Jew Water!